Now that Republicans in Congress have released a disputed and highly controversial intelligence memo alleging (with little evidence) that the FBI abused its surveillance authority, it’s time for some more valuable transparency. Donald Trump’s sons should immediately fulfill a promise made last year to donate to the federal government profits from foreign government payments to President Donald Trump’s Washington, D.C., hotel and other Trump Organization properties. Public Citizen made this demand in a letter sent to Trump’s sons Donald Trump Jr. and Eric Trump as well as other Trump Organization executives. In addition, Public Citizen said the Trump Organization should explain how it is identifying payments at Trump properties from foreign governments, provide details about the payments and about the finances at Trump properties, and release a list of all events hosted by foreign governments at Trump properties. To date, no donation has been made. The Associated Press recently reported that Trump Organization officials will have “information to share” about the hotels near the end of this month. Lawmakers have asked about the promised payment too. But the Trump Organization rebuffed a congressional request last year for information about expenditures by foreign governments at Trump properties, instead sending lawmakers an eight-page pamphlet claiming that it was “impractical” to fully identify foreign Trump organization patrons. The methodology outlined in the pamphlet also contains key flaws, as it would not require any donation from unprofitable Trump Organization properties that receive foreign government revenue. It also would not account for foreign governments that could be paying intentionally for events or rooms above the standard market rate. The New York Times in December reported that the sons have proceeded with Trump-branded real estate developments in India, Indonesia, the Philippines and Dubai. Governments in Indonesia and Panama are spending government funds to make Trump-branded developments a reality, raising even more conflict of interest concerns. Loser: Repealing the Johnson Amendment: Citizens United 2.0. The case for the Trumpy: Early in his term, speaking at the National Prayer Breakfast, Trump promised to “totally destroy” the Johnson Amendment. Few Americans had a clue what he was talking about, but his audience did. The idea is to eliminate the restriction on churches (and charities) engaging in political, electioneering activity. This has long been an objective of evangelical churches that would like to participate directly in elections. In practical terms, it threatens to permit churches and charities to function as new, tax-deductible Dark Money organizations. It is completely realistic to anticipate that the move would lead to hundreds of millions of dollars of new Dark Money flooding into elections. That’s why many advocates are calling it Citizens United 2.0. A Republican effort to include the provision in the tax bill was derailed for procedural reason, but Trump and his allies are still pushing. 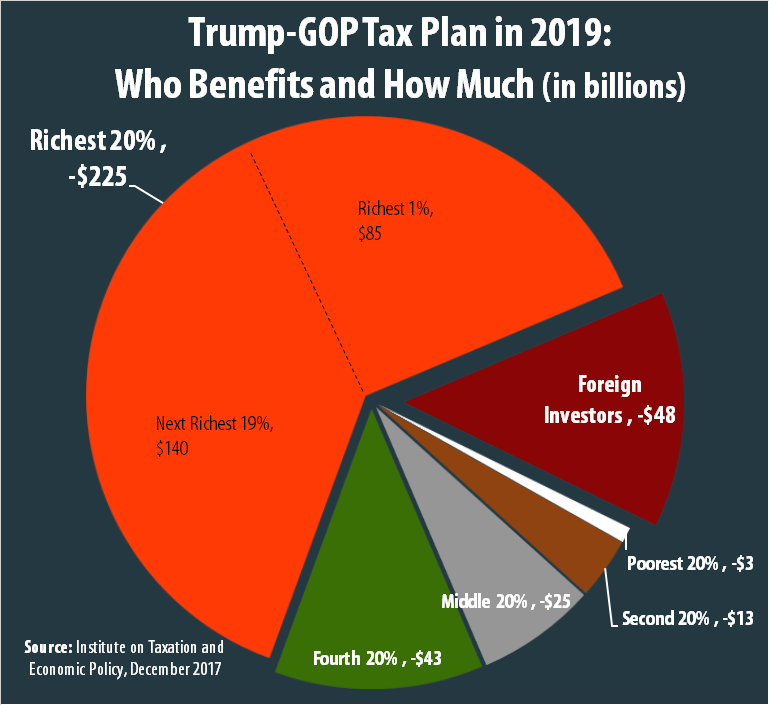 Loser: The Tax Scam: Tax Cuts for Trump and the Superrich Cabinet. The case for the Trumpy: A superrich Cabinet designed and helped ram through Congress a tax bill that will transfer more than a trillion dollars … to the superrich and the corporate class. Among notable features, the bill doubles the amount exempt from the estate tax, a huge boon for Trump and his billionaire cabinet. The pass-through provisions will confer enormous benefits on Trump himself, lowering the tax rate he pays on his business operations; a last-minute change to the bill made the deal even more generous for Trump. “This is going to cost me a fortune,” Trump said untruthfully. But he revealed the reality at a gathering at Mar-a-Lago: “You all just got a lot richer,” he told his rich friends. Runners-up: The Muslim ban, Authorizing work requirements for Medicaid recipients, ending enforcement against nursing home abuse. The case for the Trumpy: Last fall, Attorney General Jeff Sessions announced the administration would end DACA – the Deferred Action for Childhood Arrivals program, which curbed enforcement of immigration laws against immigrants without documentation who came to the United States as children. About 800,000 Dreamers are enrolled in DACA and facing deportation – in many cases to countries they do not know – unless the program is rescued by Congress in the next couple of months. Trump says he “loves the Dreamers,” has “a great love for them” and wants a “bill of love” to protect the Dreamers. But he hasn’t supported any actual legislation, and at best seems to want to hold a solution hostage to concessions on a border wall and other anti-immigrant measures, placing a priority on splitting up families. The Dreamers are the leaders of the 21st century and Trump’s actions are a disgrace. Runners-up: Net Neutrality repeal, return of private prisons, repeal of CFPB’s forced arbitration rule. Note: The judges issued a special Historic Catastrophe Trumpy to the Trump tax scam, one of the greatest transfers of wealth to the corporate sector in American history, which otherwise would have lost this category hands down. The case for the Trumpy: In October, U.S. Environmental Protection Agency Administrator Scott Pruitt – the Dirty Energy companies’ guy – moved to repeal the Clean Power Plan. The Clean Power Plan was a win for almost everyone and every industry except for coal. Not only would it reduce climate risk, it would lessen other air pollution besides carbon, saving thousands of lives and preventing tens of thousands of illnesses. And, it would significantly reduce household electric bills. A Public Citizen study found the rule would lower bills in nearly every individual state by 2025, and all states by 2030 – and by as much as 20 percent in some states. Reflecting the modesty of the Clean Power Plan’s goals and the reality that coal is increasingly uneconomical, the United States already has achieved more than three-quarters of the plan’s targeted emission reductions – just two years in, and with 13 years to go. But Scott Pruitt seems much more concerned with the views of the Coal Baron and climate change denialist Robert Murray than helping consumers, averting illness or helping address what is arguably the greatest threat humanity has ever known. Runners-up: Ryan Zinke, Mick Mulvaney, Gary Cohn. The case for the Trumpy: Among many other low-lights, Sessions has – 1. Adopted new policy for maximum charges against low-level nonviolent offenders – with disproportionate impact on people of color – while making it easy for corporate executives to evade criminal charges for overseas bribery – with massive disproportionate effect on white people. 2. Ended the Deferred Action for Childhood Arrivals (DACA) program.3. Reversed the Department of Justice’s historic defense of voting rights. Runners-up: Rex Tillerson, Betsy DeVos, Tom Price/Alex Azar. The case for the Trumpy: Among many other low-lights, Pruitt has worked to: 1. Repeal the Clean Power Plan –claiming it as an environmental achievement – and engineer the U.S. withdrawal from the Paris climate agreement. 2. Roll back 19 public health and environmental rules, covering everything from clean water to chemical safety. 3. Meet with Dirty Energy and industry interests almost 20 times more frequently than environmental organizations. That closes the Trumpy season for now. We’ll be back next year. But in the meantime, stay on the lookout for special Trumpy awards popping up throughout the year. There’s sure no shortage of awfulness to highlight. One year of Trump. One year of unprecedented conflicts of interest. Donald Trump’s sprawling set of businesses – and his refusal to divest his financial interests in hotels, golf courses, restaurants and real estate developments around the world – has presented a unique set of conflicts that previously were unimaginable for the president of the United States. Never before has a president owned a private club in Florida that hiked its membership fees shortly after the president took office and sold $750 tickets to a New Year’s party. Never before has the president of the United States owned an international real estate empire that’s deeply entangled with foreign governments and sold dozens of condominiums to secretive buyers. While some of Donald Trump’s businesses, such as his hotel in Washington, D.C. have clearly been helped by his presidency, others such as hotel ventures in New York and Toronto have been hurt by his infamy. But most alarming are the array of interest groups trying to cozy up to Trump by spending money at his properties. 4 charities, including one run by Donald Trump’s son, Eric. Why does this matter? Trump’s investments still benefit Donald Trump. A year ago, Trump released a plan purportedly addressing conflicts of interest created by simultaneously overseeing the government and owning a business empire. Instead of fully divesting from his businesses, as called for by ethics experts, good government watchdogs, and the Office of Government Ethics, Trump promised to simply “isolate” himself from the management of the Trump Organization, putting his sons in charge of the day-to-day operations of the company, while Trump’s businesses were reshuffled into holding companies held by a trust controlled by Trump himself. The Trump International Hotel which opened before the 2016 election, was constructed in a public building just blocks from the White House, resulting in highly unusual situation of a president deriving financial benefit from a private business used by entities with business before the U.S. government. Seventeen members of Congress, represented by Public Citizen, have sued to challenge a decision by the U.S. General Services Administration to withhold documents relating to Trump’s lease on a federal building. Trump’s political organization has continued to spend money at Trump properties, with five Trump-affiliated groups spending nearly $750,000 at Trump properties in the first three quarters of 2017, according to a Public Citizen analysis of Federal Election Commission data. Meanwhile, Trump’s businesses have been marketing themselves to (and profiting from) the president’s most avid fans. Those include the Trumpettes, a group of wealthy women who are ardent supporters of the president who are holding a Jan. 18 “Red, White and Blue Celebration” in honor of Trump’s first year in office. Trump fans can chew on a waygu ribeye at Washington, D.C.’s BLT Prime by David Burke or enjoy a $235 “energy and balancing ritual” at The Spa By Ivanka Trump — or even have a wedding at Trump’s New Jersey golf club. Companies with major financial interests at stake with the federal government have been big users of Trump properties. Corporate interests who have held or are planning to hold events at Trump-owned locations include the National Mining Association , the U.S. Chamber of Commerce and GEO Group, a private prison company that benefited from Attorney General Jeff Sessions’ reversal of an Obama-era decision to phase out private prisons. GEO Group donated $225,000 (see here and here) to a super-PAC supporting Trump, despite a federal ban on political donations by government contractors, according to a complaint filed by the Campaign Legal Center. Meanwhile, foreign governments, including Saudi Arabia, Malaysia and Kuwait haven’t hesitated to book rooms and hold events at Trump’s Washington, D.C. hotel, effectively paying tribute to Trump by frequenting his properties. Reps. Dana Rohrabacher (R-Calif.), Tom MacArthur (R-N.J) and Jodey Arrington have all held fundraisers at Trump properties, and many more lawmakers have held smaller events. NOTE: The information in this report comes from news stories as well as Federal Election Commission records for political expenditures above $100 including events, food, lodging, rent and travel expenses at Trump properties. Dates refer to event date and dates of disbursement as recorded in FEC’s database. The full spreadsheet with sources is available here.